Whitechapel Road in East London is always a busy place during Friday prayers for the Muslim community. This week the crowds just didn't stop coming. 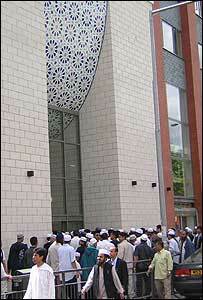 The opening of a huge new £10.4m community centre attached to the East London Mosque prompted the arrival of 15,000 people. They came to pray, to witness the official opening of the six-storey centre, and to hear one of the Muslim world's most renowned prayer leaders. By 1100 BST - two hours before the Imam was due to lead the prayers and inaugurate the new centre - the main mosque was jammed full to its 3,000 capacity. But still they came, flooding through the doors of the towering 10,000-capacity Muslim centre next door, all six floors of which were open for people to conduct their prayers. Student Nsheila Ahmed explains she regularly uses the mosque for prayers because it's nearby to London Met university, where she is studying law. But she and her friends are especially keen to get inside today. They want to see for themselves the centre they have heard so much about, and to hear the Imam who has come from the holiest mosque in the Muslim world. "He is so special - renowned among Muslim people," she says. She and her friends say they are keen to take part in the arts and cultural aspects of the London Muslim Centre, which claims to be the largest centre of its kind in Western Europe. "We'll come here for the arts and crafts, and literature. 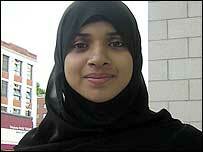 They'll have Islamic art and calligraphy and things like that," says 19-year-old Mumtahanah Jaigirdar, from Newham. "It's good, because being brought up here means you are not often exposed to this kind of thing. And it's open to all, so those who don't know about Islam can come." These young women have arrived early enough to get in. By 1300 BST the street behind the mosque is gridlocked with people. I just manage to squeeze out of there before it has to be closed off. The road is carpeted with the prayer mats of those who have given up any hope of getting inside. Men hold newspapers over their heads to protect them from the blazing sun. There's disappointment they can't gain access today, but deafening loudspeakers provide them with the voice they all want to hear, that of Sheikh Abdur-Rahman al-Sudays, Imam of the Ka'ba, Islam's holiest mosque in Mecca. Back out front stewards climbed onto pallets left there by the builders, who were still frantically grouting the shiny new stairway before lunch on Friday. The volunteers waved and shouted, directing people to the few spaces left for entry. Among the crowd is 30-year-old British-born Pakistani Abed Bhatti, who works down the road from the centre at Thomson Financial. "The opening has created such fervour." "The opening has created such fervour. It is good in so many ways. As well as building links in the wider community it will build ties with the corporate community. "Non-Muslims can see what it's all about, and not just see the negative. "It will also get the kids off the streets." Sunara Bint Aftara, 19, waves through the glass as her mother makes her way up to find a space in the community centre. She is still outside and hoping to make it inside soon before the Imam speaks. As a volunteer for the Islamic Awareness Project she is excited about the concept of a centre that will work to educate and build cohesion in the community. "I'll probably use the gym and sauna here, and the dark rooms because I'm interested in photography. "I want to do some voluntary teaching and take part in some of the courses here, like Arabic," she says. I leave her queuing and make my way to the mosque where the Imam is already speaking to the throng. After prayers we make our way to the roof. From our vantage point we can look down over the chattering crowd as they spill out back onto the Whitechapel Road, and get back to the business of another Friday in East London.